I can remember vividly landing in Bangkok – the sights, the smells, the heat – it was all so new and exciting. It was a completely different culture to that of Australasia (where we had spent the past 11 months) and the experience started just as I imagined. Today I want to share my favourite moment of our travels, which happen a few days after arriving in Thailand (back when we were travelling south east Asia in 2013). Our plan for the day was to take a bus to Ko Samet, we had been to the bus station the day before to purchase our tickets and were completely prepared. That was until my boyfriend left his iPhone in the hostel charging, we had made it all the way to the bus station before he realised. Deciding the phone was worth it, I opted to look after our bags as he travelled across Bangkok to retrieve a phone that might not even be there by now. I sat watching the minutes tick by, we’d missed our bus to Ko Samet by now. Luckily he arrived back with his iPhone and the missed bus was worth it. With a change of plans we took a bus to Trat instead. The plan then was to head to the island of Ko Chang. Problem was because of our earlier situation we were on a much later bus than we wanted to be. If we made the final ferry to the island that night, it would be a miracle. With another backpacking couple we hailed the first taxi we saw in Trat, not bothering to haggle, not caring if it was the most expensive – we had no time to waste. Sitting in the back of that pick up truck with our new friends life hit me. The wind was whipping through my hair and the countryside was rushing past our faces as our driver missioned us to the ferry – at least he understood the urgency. Seeing the ferry still waiting as we pulled in to the port was such a relief but the real moment when I suddenly realised how alive I felt and how magic travel is, was when we arrived on the island. We hoped in another pick up truck with the same couple and began to wind around the island in the pitch black. Creating images in my head of what the island would look like in the day light. I had no ideas where we were heading and that was okay. The wind whipped through my hair as we drove forward in the dark, Lonely Beach we had told the taxi driver. Due to our last minute change of plans we had no idea where Lonely Beach was, if it was good but we liked the name. Through the darkness I couldn’t tell how far we had travelled when finally the taxi driver announced we were at Lonely Beach. We grabbed our bags and wondered in search of some accommodation. This part of the island was well lit and lively, it seemed like we may have chosen the right place. We wandered for what felt like forever working out the accommodation options, the cost, the facilities when eventually we settled on Seaflower Resort – a sea-view bungalow with air con and en suite for 600B a night. It was perfect for our first night in what seemed like paradise. After settling in to our room, we headed to one of the local bars for food, drinks and music. In typical Thai fashion we were sat on the floor and had, had to leave our shoes at the door. Having only been in Asia for a few days we were still getting used to the food. 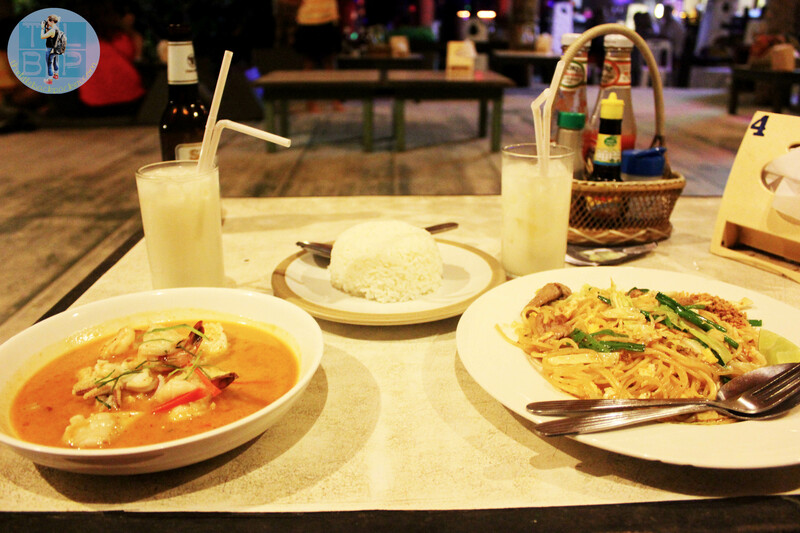 I managed to order something with huge chillies in it – I learnt my lesson about Thai food that night. The rest of our stay on Ko Chang passed with the same blissfully happy and alive feeling. Something I hadn’t experience though Australia or New Zealand. Through the journey to Ko Chang I had found my happy place and if I’m ever having a bad day, I just imagine I’m back in that pick up truck winding around Ko Chang with the warm sea air whipping through my hair. If you’d like to know more about Ko Chang and the reason I decided to visit then check this blog by Adventurous Kate. I love those travel moments! And I usually find that they happen when you are least expecting it. Thailand is such a special place, I have some lovely memories from there. I’ve been peaking at your blog now and again as you popped up in various Google searches. It looks like you’ve had some truly great experiences. I love arriving somewhere at night, somehow everything seems that bit more magic and that much more of an adventure.